Jeremy Hicks, the co-creator of the Cycle of Ages Saga, will return to Viking Hall in Bristol, Tennessee this weekend for Rob-Con 2017. He will be there to showcase the release of Cycle of Ages Saga: Delve Deep, the mind-blowing third installment in the series and his first novel as a solo writer. Come to our table on the stage if you’d like a signed copy of Delve Deep or any of our novels or anthologies. We’ll also have a few selections from other authors available. Most paperbacks will be 2 for $20 all weekend, but you can buy the extant Cycle of Ages Saga novels at a discount (3 novels for $33). If you take advantage of the three-volume Cycle of Ages Saga deal, you will also receive a FREE first-edition hardcover copy of Finders Keepers (while supplies last). Act quickly because the remaining first editions are extremely limited. There will be other promotional items available on a first-come-first-serve basis. In addition to Broke Guys Productions, 100 other authors, artists, actors, vendors, and others will have booths and tables filling the convention hall. Plus, if you’re a fan of Timothy Zahn, he is the Literary Guest of Honor this year, so bring or buy a book for him to sign. You can be a part of it all. Just click the Rob-Con logo for more details. Join our e-mail subscription list by clicking HERE. Then check your inbox for a promo code for your FREE EPUB copy of the Cycle of Ages Saga: Finders Keepers via Smashwords. Your confirmation email should arrive within a few hours. Offer is limited. Promo code is only good until 5/30/2017. Sands of Sorrow Launches Today! Kindle Version only 99 CENTS!!! The intense sequel to the Cycle of Ages Saga: Finders Keepers is live on Amazon now, so we’re happy to offer the Kindle version of Sands of Sorrow to you for the introductory price of 99 CENTS!!! Buy it HERE! The Master-of-Disaster is back in this exciting, no-holds-barred sequel to the Cycle of Ages Saga: Finders Keepers! With his primary mission on hold for now, Kaladimus Dor continues his association with the mercenary guild known as Finders Keepers as they search for the first missing piece to the Hallowed Vessel, its original figurehead. However, his companion, Yax’Kaqix, makes a fateful decision to honor a promise to a dead man that will set them on a path to change the fates of thousands and set them on a course for adventure across the Sands of Sorrow, a haunted, unnatural desert created at the cataclysmic end of the previous cycle of ages. What will this dramatic detour cost them in the end? What will it cost Dor…and possibly all of Faltyr? If you prefer a paperback instead, they’re available for $11.95. You can find them HERE! PIEDMONT, ALABAMA, September 30, 2015– Local authors Jeremy Hicks and Barry Hayes are happy to announce the publication of their second novel, Sands of Sorrow, the next installment in a fantasy series called The Cycle of Ages Saga. Though it will be available online through Amazon and other retailers by week’s end, they will officially launch it at Huntsville’s Rocket City Lit Fest on October 10, 2015. A native of Piedmont and Jacksonville State University alumnus, Jeremy Hicks spent several years working as a field archaeologist throughout the Southeast before teaming up with his co-author and longtime friend, Barry Hayes, to realize a shared creative dream. They created an original horror-fantasy environment (Faltyr™), wrote a screenplay to introduce it, and then started a company (Broke Guys Productions) to promote it. They adapted it into a novelization of the same name; and their first novel, (The Cycle of Ages Saga: Finders Keepers), was published by Dark Oak Press at the end of July 2013. Barry and Jeremy have appeared at book signings and conventions around the Southeast to promote their book, including Decatur Book Festival and Alabama Phoenix Festival. Sands of Sorrow is their second novel together. It continues the adventures of the Master-of-Disaster (Kaladimus Dor) and his wise-cracking buddies, the mercenaries of Finders Keepers. Cover art was produced by Rob E. Brown, former Marvel artist and the current artist for the Bela Lugosi estate. Graphic design was completed by Kevin “Fritz” Fotovich, Raytheon employee and another JSU graduate. When asked what he thought about the epic new cover, co-writer Barry Hayes was quoted as saying, “By god, I like it!” Mr. Hicks was unavailable for comment as he was busy writing this press release. If you would like more information about the Cycle of Ages Saga or Broke Guys Productions, please contact Jeremy Hicks at brokeguysproductions@gmail.com. For information on Rocket City Literary Festival, go to http://www.rocketcitylitfest.com/. 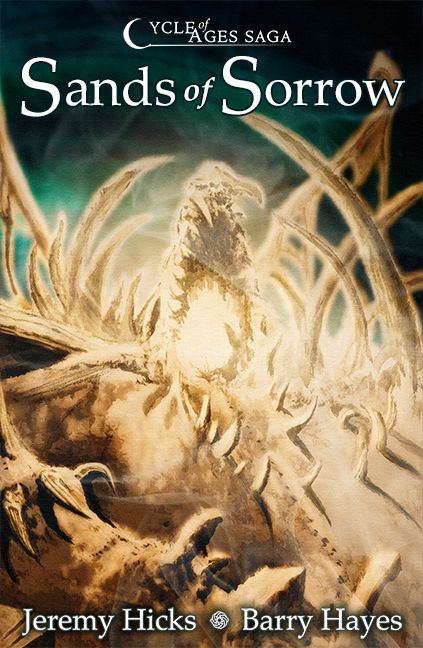 Check out the new cover for the Cycle of Ages Saga: Sands of Sorrow, the upcoming sequel to Finders Keepers. This novel will be available Fall 2015 from Broke Guys Productions. Cover art by Rob E. Brown. Graphic design by Kevin “Fritz” Fotovich. Thanks, guys! Enter now to win one of two paperback copies of the Cycle of Ages Saga: Finders Keepers from Amazon! Enter fast. Contest ends July 23, 2015. No purchase necessary. Twitter account required to enter. 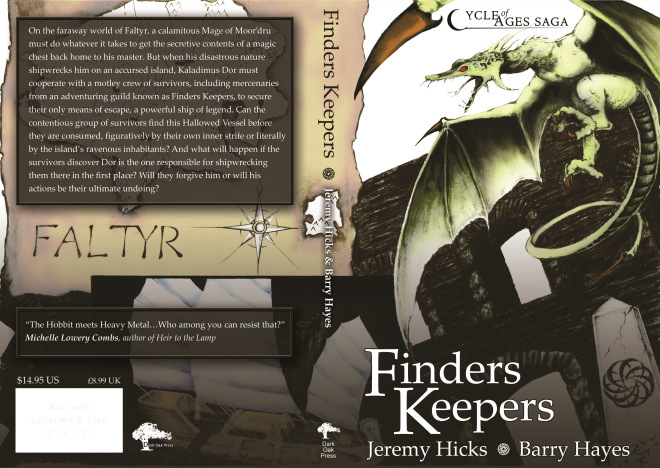 Paperback cover design from the second edition of the Cycle of Ages Saga: Finders Keepers.